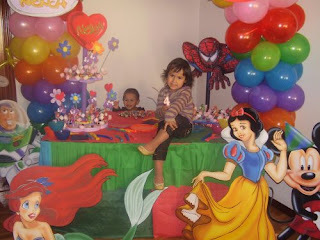 Birthday is coming for your so loved child and what you want most is that the party maked for him should be a complete success? then we suggest the organization and timing so that everything is perfect. The first thing to decide is the date on which you carry out the party, in accordance with this decision you must book the local room in which you will realize your son's birthday, the lead time with which you do this depends on several factors, if the birthday coincides with the dates on which there are many festivals, spring day, Halloween, New Year parties, among others, is a good idea to separate the local room with about two months in advance, but if you have this intersection of celebrations , making reservations a month earlier, is sufficient. Then define the birthday theme, remember to consider your favorite child themes. Decide whether you will buy everything you need or do your selfe the some elements, for example some people like to make cards or boxes of surprises, we suggest that if you have time available, buy everything cause you can now find variety and quality. Do not forget to engage the children's show, can be clowns, clowns and dance groups, this depends largely on the age of your little one as many times boys and girls aged 8 or 9 years, prefer to enjoy the choreography of one group than a clown's jokes, whatever they choose, always a good idea that someone else help you with the birthday development. For the decor, you also have the option to make the details yourself or engage this service, remember that in the place to buy all supplies for the party usually have a list of providers of other services, including the decoration. Remember that if you decide to prepare a snack for kids or adults, preferably should be ready the day before to avoid stress on the party day.